This tutorial will be showing you how to install uTorrent in Ubuntu 16.04 LTS and Ubuntu 17.10. 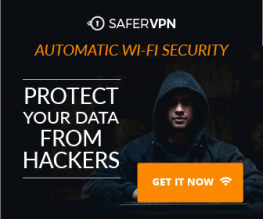 It also includes instructions on how to set up a reverse proxy using Nginx/Apache and auto start uTorrent server on Ubuntu. The native uTorrent client for Linux is a web-based application. The latest version was released for Ubuntu 13.04, but we can still run it in Ubuntu 16.04 LTS and Ubuntu 17.10. 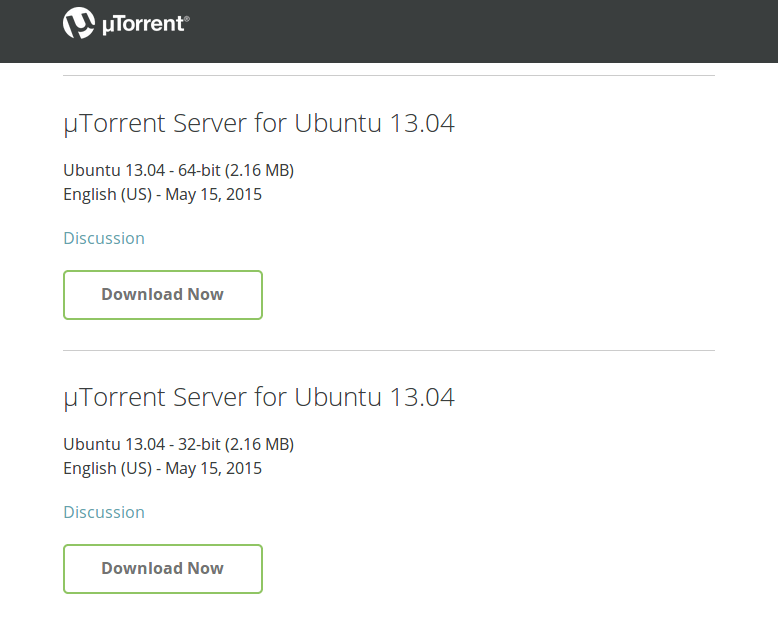 Go to uTorrent Linux download page to download the uTorrent server package for Ubuntu 13.04. Alternatively, you can open up a terminal window and run the following command to download it from the command line. Once downloaded, change working directory to the directory where uTorrent server file is downloaded. Then run the following command to extract the tar.gz file to /opt/ directory. Next, install required dependencies by executing the following command. Then create a symbolic link. Use the following command to start uTorrent server. By default, uTorrent server listens on 0.0.0.0:8080. If there’s another service also listens on port 8080, you should temporarily stop that service. uTorrent will also use port 10000 and 6881. If you are installing uTorrent on your local computer, then replace your-server-ip with localhost. Please note that /gui is needed in the URL, otherwise you will encounter invalid request error. When asked for username and password, enter admin in username field and leave password filed empty. Once you are logged in, you should change the admin password by clicking the gear icon, then selecting Web UI on the left menu. You can change both the username and password, which is more secure than using admin as the username. If you have other service listening on port 8080, then in the Connectivity section, you can change the uTorrent listening port to other port like 8081. After changing the port, you must restart uTorrent server with the following commands. You can set default download directory in the Directories tab. To access your uTorrent server from a remote connection using a domain name, you can set up Nginx reverse proxy. If your Ubuntu box already have a website served by Nginx, then you can configure the existing Nginx server block so that you can access uTorrent Web UI from a sub-directory of your domain name. In the server block, paste the following directives. If you changed the port before, then you need to change it here too. Paste the following text into the file. Replace utorrent.your-domain.com with your preferred sub-domain and don’t forget to create A record for it. To use Apache as a reverse proxy, we need to enable the proxy modules and we will also enable the rewrite module. Then create a virtual host file for uTorrent. Put the following configurations into the file. Replace utorrent.your-domain.com with your actual domain name and don’t forget to set an A record for it. 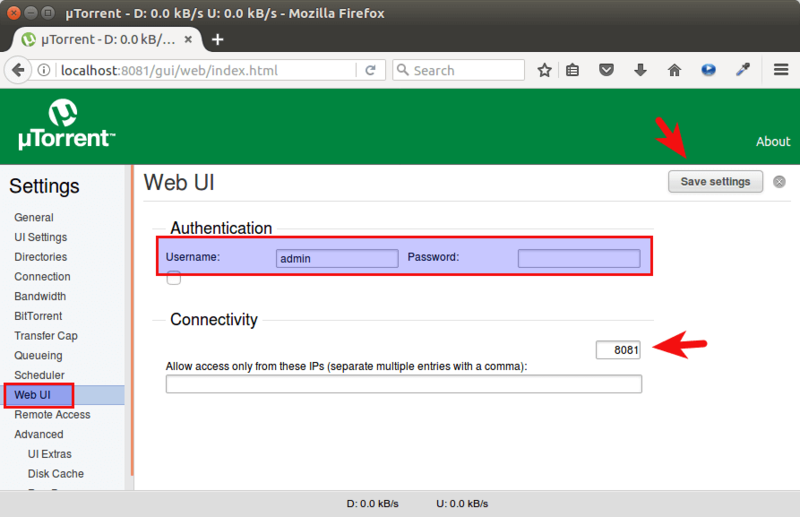 Now you can remotely access uTorrent server by entering the subdomain (utorrent.your-domain.com ) in browser address bar. If uTorrent Web UI doesn’t load, then you may need to delete the default virtual host file and restart Apache web server. To enable auto start, we can create a systemd service. Note that it’s recommended not to run uTorrent server as root, so we’ve specified in the service file that uTorrent server should run as the utorrent user and group, which have no root privileges. Create the utorrent system user and group with the following command. Add the utorrent user to the utorrent group. Next, Stop the current uTorrent server. Use the systemd service to start uTorrent server. We can see that auto start is enabled and uTorrent server is running. When creating the utorrent user, a home directory was also created at /home/utorrent/. It’s recommended that you set this home directory as your torrent download directory because the utorrent user has write permission. We also need to make utorrent as the owner of the /opt/utorrent-server-alpha-v3_3/ directory by executing the following command. To remove uTorrent, first stop the current uTorrent process. Then remove the installation directory. And remove the symbolic link. That’s it! I hope this tutorial helped you install uTorrent on Ubuntu 16.04 LTS and Ubuntu 17.04. You may also want to check out tutorials on how to install Deluge or qBitTorrent on Ubuntu. Is there any way with nginx to use only utorrent.mydomain.com instead of utorrent.mydomain.com/gui ? hi. I forgot my password. How do I reset. thanks. Hi linuxbabe, I am new to linux and luckily found your instrustions/explanation to install utorrent.. which I have been using for years in windows, but I figure running it on linus would be less likely to get virus etc.. I followed your above to the letter and everything works as it should except that once the uttorent web UI is running in the browser, I am UNABLE to add any torrent files to the utorrent interface, so I cannot download anything. It worked fine before making it “autorun” and using it as a limited user group.. before those steps I was able to download without issue.. Also I cannot change the username and PW for utorrent or the directories since making the running changes.. sounds like an access issue to me, am I in the correct user group or something..!!!?? Is there some additional setup required in order to execute utserver as non-privileged user on boot? May 16 00:45:20 ubuntuserver systemd: Stopped uTorrent Server. May 16 00:45:20 ubuntuserver systemd: Started uTorrent Server. May 16 00:45:20 ubuntuserver systemd: utserver.service: Unit entered failed state. May 16 00:45:20 ubuntuserver systemd: utserver.service: Failed with result 'exit-code'. May 16 00:45:20 ubuntuserver systemd: utserver.service: Service hold-off time over, scheduling restart. May 16 00:45:20 ubuntuserver systemd: utserver.service: Start request repeated too quickly. May 16 00:45:20 ubuntuserver systemd: Failed to start uTorrent Server. I’ve tried something like this: `sudo -H -u utorrent /usr/bin/utserver -settingspath /opt/utorrent-server-alpha-v3_3/ &`. It says `sudo: /usr/bin/utserver: command not found`. i get error, how i can fix or i doing something wrong?? ?